here I will explain how to send bulk email in asp.net using c#, vb.net with example. To send mail to bulk people in asp.net we need to get all the user email ids and send mail to each emailid by using foreach loop in asp.net using c#, vb.net. In previous post I explained send html page as mail body in asp.net, send mail with images using gmail user credentials, send multiple attachments with email in asp.net, how to send mail with attachment in asp.net and many more articles related to asp.net using c#, vb.net. Now I will explain how to send bulk email in asp.net using c#, vb.net with example. 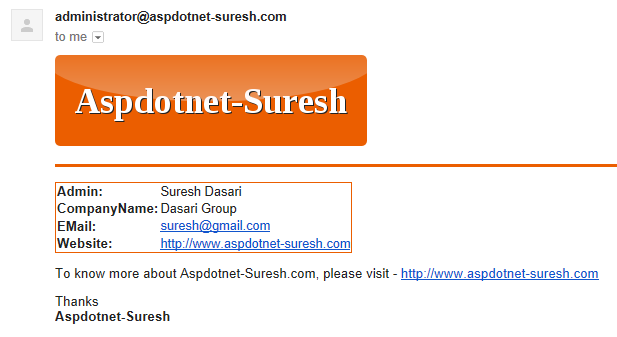 Dim from As String = "administrator@aspdotnet-suresh.com"
Msg.Subject = "Send Bulk mail for all users"
Dim sSmtpServer As String = "10.82.42.122"
your code looks good just for 20-30 email ids,, but if use 500 or more emails then program shows time out as it takes a lot of time so that server displays time out error. how we can get rid of this problem. ?